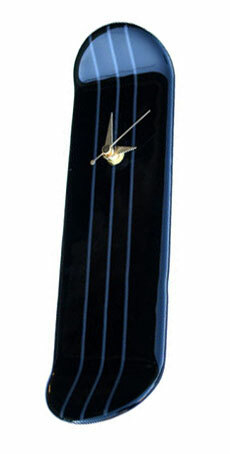 Stunning handmade fused glass wall clock.....have you ever seen anything like it before!!?? Set in a SKATEBOARD design, with raised end lips, and fused in funky eye catching colours....the colour combination here is a gloss black with a funky Deco grey stripes design. These clocks are handmade and fused here in the UK and really will be a wow factor for any room in your home or office!! A good sized 30cm H x 9cm W x 4.5cm D.